If you have read my book bio, you know that as a Master Gardener one of my interests is vegetable gardening. In addition landscape design is also high on the list. One of the secrets taught in design classes is to create a mystery in your landscape, something that will pull a visitor to the next part of your garden. In career/ job search the same lesson applies. In this case it’s creating an interest on the part of the prospective employer so that they will have you come back for successive interview sessions. How do I manage this? After all, my work ( resume) is an open book (as it should be). Good question I say and let you know it is very simple. Learn to ask meaningful questions. 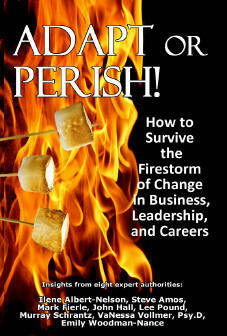 Our book Adapt or Perish and it’s co-authors have included a number of chapters on the subject. In a minute I will give you a few references. What key areas would you like me to focus on in the first 90 days? This creates a dialogue rather than a monologue. For a better reference read my chapter on the Seven Step Interview process or co-author John Hall’s chapter on developing a Case Study. I hope you get the concept that focus on gathering information by asking questions will enable you to, along with preparation, make the best possible case for the company to hire you. Thus take the mystery out of What’s Around the Bend!